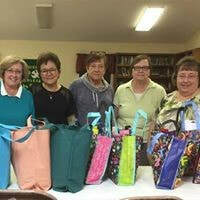 Busy Women's Fellowship (BWF) - a study and fellowship group of busy women, started in 2009. This group developes stronger relationships and provides positive support to one another. Each meeting has a program including a wide range of topics. There have been fun programs and most certainly learning programs, all to help us on our faith journey. Prayer is an important part of BWF, as we share our concerns and joys. Prayer is encouraged for each other on a daily basis. Topics covered recently have been the colors of our church year and what they mean. 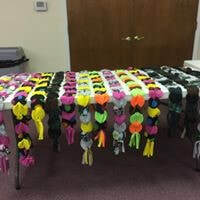 Along those lines, the Busy Women decided to make new bookmarks for all the hymnals, and the ribbons used on the bookmarks will reflect our liturgical colors. This project is near completion, and we hope to have them blessed and in the hymnals in the near future. Other projects and programs we have conducted include the needs of the homeless, especially those in SafeHaven, a safe place for abused women and children. 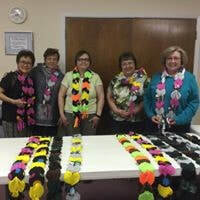 To that end, we made scarves as part of our program, and put together tote bags of things for women and children at SafeHaven. Through the years, there have been many projects to benefit others conducted by BWF. All women are invited to join us. We meet on the third Tuesday of each month. The meetings begin at 7:00 PM, and those who want to bring a sack lunch meet at 6:30 PM at the church.